You are so wildly busy these days, I don’t even know where to begin, except that I obviously do: please tell readers all about your upcoming fantasy out this month, We Set the Dark on Fire! Yes! 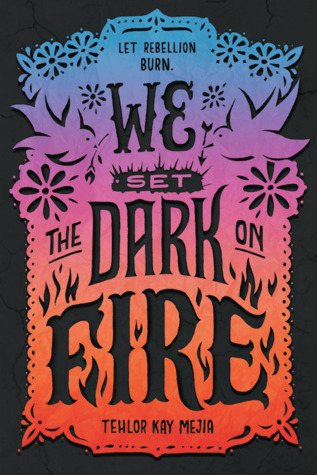 We Set the Dark on Fire is a feminist, dystopian YA fantasy set in a Latin-American inspired country called Medio where upper class men are assigned two wives when they come of age. The book’s main character, Dani Vargas, is assigned to a very high profile political family along with a second wife – her longtime school rival Carmen Santos. The government itself is very patriarchal and restrictive for women, and their husband is a nightmare, and on top of that Dani is hiding a major secret about her citizenship status in Medio – namely that it’s all a lie, and one that comes with deadly consequences if she’s found out. She’s approached early in the book to spy for a rebel organization fighting to bring equality to the two warring sides of the country, and it begins a book-long internal struggle for her about who she is and what her place is in this world. Also there’s some f/f enemies-to-lovers going on and hopefully enough kissing to balance out some of the darker political vibes! Before your first novel even released, you were already getting tapped for anthology work. Can you share a little bit about your stories in All Out and Toil & Trouble, and what it was like getting published in short-form first? I had actually only ever written one short story when I was approached to do All Out, so I was really nervous. But Saundra Mitchell is an amazing editor, and even though the path to my story “Healing Rosa” wasn’t exactly straightforward I always felt really supported and free to explore what I needed to there. It was a really great experience for my first time ever being published, and I’m still really proud of the story (a queer historical tale of a teen curandera healing the girl she loves) and grateful to everyone who’s enjoyed it. 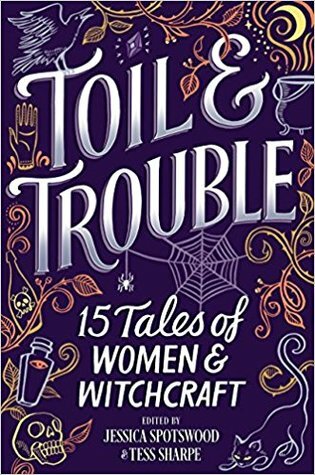 In Toil & Trouble I wanted to do something really contemporary and modern, the anthology is about witchcraft, and for most people that seems like a fantasy or paranormal theme. For me though, magic is culturally sort of ordinary in this beautiful way, and I wanted to take the opportunity to remind people that while “witches” are a very fantastical pop culture thing, witchcraft and a lot of the things we associate with it are actually daily occurrences in a lot of cultures. Getting published in short form first was interesting, mostly because the themes both called for stories that are very different from We Set the Dark on Fire’s style, so I’ll be interested to see how people who loved those stories will respond to the novel. In addition to your fantasy series, you’ve also got a (non-queer, I assume?) 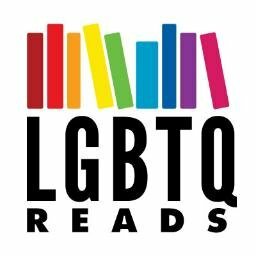 Middle Grade series coming up with Rick Riordan presents, but you’ve also got a co-authored novel coming up with LGBTQReads Fave Anna-Marie McLemore. What can you share about Meteor, and does it fall under the rainbow along with both of your other YA work? There will definitely be queer characters in my Middle Grade, but no, not the main characters this time. And yes, we’ve been a little tight-lipped about Meteor so far! That will change as the release date gets closer, I promise. For now I can say it’s a small-town book that really explores what it’s like being different when you’re under that kind of social and cultural microscope. The thing I love most about the book is that while there are two very swoony love interests, it’s primarily a story about how strong female friendship is, and how much it can overcome even when the friendship itself is complicated. Also yes, it’s very queer! What was the experience of co-authoring like, and what kind of writers and friends would you recommend it for? From my perspective I can say that it’s sort of unnerving at first to work with one of your heroes! I was such a fan of Anna-Marie’s work long before we were ever friends, let alone considering working together, so there was some definite anxiety when we actually got down to the process of getting words on the page. Luckily for me, Anna-Marie isn’t only absurdly talented, but also one of the most gracious, kind people I know, so once we got into our groove the writing process was actually wonderful. We both have very distinctive styles, but I think we’re inspired by so many of the same feelings and experiences that it really grew from a place that felt organic. I believe to this day that there was something alchemical or magical happening during the process of our first draft, and we’re both really proud of the book and so excited to share it with the world next year. As far as cowriting in general and who should do it, the only thing I’ll say is that communication is so important. It’s intense to allow someone into your creative space, not to mention the business aspect of things. I think you have to be willing to be so honest about what you each expect and/or want out of the experience at every stage. And that’s just the beginning, really. But if you feel like you can expect that from each other, it can really be beautiful. You’re very heavily and wonderfully into promoting your Latinx author sibs, so here’s another shot to do that: any queer Latinx lit you’d like to give a shout? Yes! Thank you! My favorite question! I’m so deeply grateful for Zoraida Cordova’s Labyrinth Lost for depicting a bi Latina in a fantasy setting. It was the first time I’d ever seen that identity intersection on the page, and it’s so, so well done. Then Juliet Takes a Breath by Gabby Rivera, who is such a powerhouse, is a book I will never stop screaming about. It’s so unapologetically queer and such a handbook for finding your way to self-love as you embrace your identity and find your community. In terms of upcoming books, I’m literally losing my cool over Adam Silvera writing a fantasy – Infinity Son is out in January, though I’m really gonna try to snag a copy before then let’s be real. And last but for sure not least is All of Us With Wings by Michelle Ruíz Keil, which might actually be my favorite book, ever. Post-punk San Francisco, a healthy dose of magical realism, a rockstar family, and a bi Mexican-American character that is the closest I’ve come to seeing my own experience reflected in a book. It’s out in June and you don’t want to miss it, trust me. And speaking of recommendations, queer fantasy has been majorly on the rise, which is just delightful. Once readers have read and loved We Set the Dark on Fire, where do you recommend they go next? Okay, right? There’s still so far to go in terms of reflecting more intersections but I’m so here for how much queer fantasy is happening right now. Of course, Audrey Coulthurst’s Of Fire and Stars (how excited are we all for a sequel this year?) Basically anything and everything by Malinda Lo, who is one of my forever heroes. I just finished Girls of Paper and Fire by Natasha Ngan which was breathtaking. Current read is Black Wings Beating by Alex London, which I’m loving so far. And then Priory of the Orange Tree by Samantha Shannon is out the same day as my book and I think I might actually be more excited for her book than my own, so there’s a start! What’s your first recollection of LGBTQAP rep in media, for better or for worse? How about queer Latinx rep in particular? Ricky Vasquez from My So-Called Life was probably the first ever in both categories, and he will always have a very special place in my heart, even though he didn’t have much to do with my own personal queer awakening. Probably the first time I saw something I related to was in Empress of the World by Sara Ryan which I read in its entirety in a library chair my freshman year of high school just freaking out. It’s so heartening how much more queer content is out there in the media right now though, I really hope that makes it easier for teens today than it was for us growing up – although I’m sure this age of hyper-visibility has its own unique struggles, too. It seems a little silly to ask what’s up next for you when we can see your dance card is full up until 2021 or so, so I’ll ask this instead: what writing opportunity would you still squeeze into your hectic schedule if it arose? My answer to this has been the same since before she won the National Book Award, but I would absolutely lose my cool to collaborate with Elizabeth Acevedo in any way shape or form. I’m also very casually between-deadlines working on my very first adult project, which may never see the light of day, but is really exciting in a this-is-the-book-I-pretentiously-yearned-to-write-in-high-school kind of way. Lastly I’d really love to do more anthologies! Especially culturally inspired ones, but also just anything with an odd or super-specific theme. We Set the Dark on Fire releases on February 26th. Preorder it now! Tehlor Kay Mejia is an author of Young Adult and Middle Grade fantasy at home in the wild woods and alpine meadows of Southern Oregon. When she’s not writing, you can find her plucking at her guitar, stealing rosemary sprigs from overgrown gardens, or trying to make the perfect vegan tamale. She is active in the Latinx lit community, and passionate about representation for marginalized teens in media. You can find her on Twitter and Instagram @tehlorkay.